VietNamNet Bridge - The Ministry of Industry and Trade (MOIT) is considering new measures for the solar power industry. The ministry recently asked for the government’s permission to approve another 17 solar power projects. Deputy Minister Hoang Quoc Vuong said MOIT is considering auctioning solar power projects to choose the best and most capable investors. The policy would settle existing problems as it would reflect the market price at the time the projects are under construction. Meanwhile, Vietnam will have enough time to develop transmission lines. FIT (feed in tariff), or the electricity price applied for solar power projects, will be valid for the entire life cycle of projects, or 20 years. Thuan Binh Wind Power JSC, established in 2009, is planning to develop renewable energy projects in the Central Highlands and Ninh Thuan province. Its projects are expected to have capacity of 1,000 MW, one third of which will be wind power and the remaining solar. However, Bui Van Thinh, CEO of Thuan Binh, complained that investors are meeting difficulties because the electricity price is unpredictable. 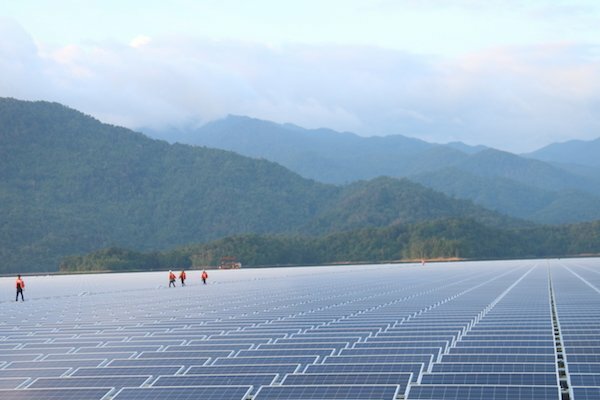 The current price at which Electricity of Vietnam (EVN) buys from solar power plants will last until June 30, 2019. “So we have to delay the implementation of our projects until the government sets the new price level after that day,” Binh said. Another big concern for solar power project developers is the limited absorption of the national grid. The electricity transmission line in Phu Lac now can absorb 100 MW of electricity only, while the registered projects have total capacity of 400-500 MW. The government, in an effort to encourage the generation of ‘clean electricity’, has created attractive policies that call for private investment in the field. These include Decision 11, which says that solar power investors can sell electricity at VND2,086 per kwh, or 9.35 cent. This decision led to a boom in solar power projects, which could put pressure on transmission lines. According to MOIT, by the end of August 2018, 121 solar power projects had been added to the national power development program with total electricity capacity of 6,100 MW. In related news, the government has requested MOIT to clarify the risks in developing solar power projects after some experts expressed concern about the “hot development” of solar power.